Tapioca starch is also called tapioca flour. Used to thicken various Asian dishes. Made from pure tapioca, the general purpose is similar to flour. Also an important ingredient in various Thai desserts. 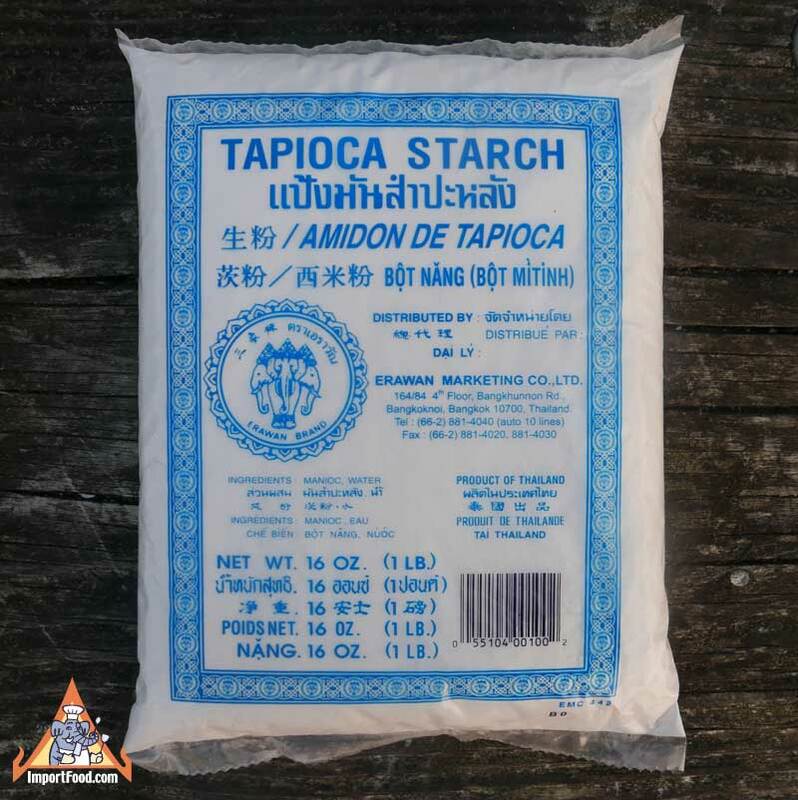 Authentic Thai recipes using tapioca starch listed below. Also see: Tapioca Starch On Video: Street Vendor Prepares Radna. Ingredients: tapioca, water. All natural. Product of Thailand. Thai style wide noodles in thick sauce, "Kuaitiao Radna"
Spicy Thai Wings, "Peek Gai Nam Daeng"
Mixed Sticky Rice & Coconut Milk with Fruit, "Khao Neeo Dahm Polamai"
Durian Flavored Sticky Rice in Coconut Milk, "Khao Neeo Durian"
Thai Fried Rice with Chicken, "Khao Pad Namprik Pao Sai Kai"
Thai style fried mussels, "Hoi Tod"